english name "European False Blusher"
intro The following description is largely based on Bertillon (1866), Breitenbach and Kränzlin (1995), and Neville and Poumarat (2004). cap The cap of A. excelsa is 50 - 120 (-150) mm wide, gray-brown or umber-brown or olive brown, hemispheric when young, convex, then plane, with an incurved and nonstriate margin. The cap is initially covered with a volva, which on expansion of the cap, disrupts into thin, mealy, gray, irregular patches of volval tissue which are easily removable. The cap flesh is white and rather thick above the stem. gills The gills are crowded, white, adnexed, 4 - 9 mm broad, with an undecorated to finely flocculose edge. Short gills are present in sets of one to three between every pair of full length gills. stem The stem is 60 - 120 (-150) × 15 - 30 mm, slightly narrowing upward, solid, white to pale gray and striate above the ring. It is covered with inconspicuous, white to pale gray, granular scales below the ring, which form concentric circles towards the base. The base is enlarged to a bulb up to 40 mm wide but can sometimes be barely broader than the stem when the stem is fully expanded. The ring is membranous, skirt-like, with the upper surface striate. The volva is present as 2 - 5 pale ocher brown zones of friable material above the bulb. The flesh is firm. odor/taste Odor is faintly grass-like according to some European authors. Other European authors say it has a faint odor or taste of radish. spores The spores measure, according to Neville and Poumarat, (7.0-) 7.5 - 10.0 (-13.5) × (5.0-) 5.5 - 7.0 (-8.0) µm and are broadly ellipsoid to ellipsoid, occasionally elongate and amyloid. Clamps are absent at bases of basidia. discussion The species was originally described from Sweden. In Switzerland, Breitenbach and Kränzlin say that, while it occurs at lower altitudes, it is largely montane. Neville and Poumarat list associations with Fir (Abies), Spruce (Picea), Pine (Pinus), Oak (Quercus), and Beech (Fagus). It is said to occur in Morocco with imported Eucalyptus. It is reported to have been imported to South Africa with European trees, but RET could not confirm this from material made available to him. Neville and Poumarat (2004) designated a plate of Krombholz as the neotype of this species. They reprint this image as Plate 82 in the first volume of their Amaniteae. RET has expressed his concern about the value of taking a plate as a neotype (Tulloss, 2005). European authors often comment on the variable nature of this species. Neville and Poumarat accept a number of varieties and forms of the present species. author (Fr. : Fr.) Bertillon in DeChambre. 1866. Dict. Encycl. Sci. Med. 1(3): 499. ≡Amanita spissa var. excelsa (Fr. : Fr.) Dörfelt & I. L. Roth. ad int. 1981. Mitt. Florist. Kart. (Halle) 7(1): 29. ≡Venenarius excelsus (Fr. : Fr.) Murrill. 1948. Lloydia 11: 161. ≡Fungus viscidus Paulet. 1793. Trait. Champ. 2: 355, index . 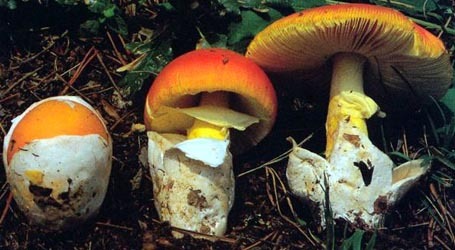 ≡Amanita ampla Pers. 1801. Syn. Meth. Fung. 2: 255. ≡Amplariella ampla (Pers.) E.-J. Gilbert. 1940. Iconogr. Mycol. (Milan) 27, suppl. (1): 78, tab. 39 (figs. 2-6), tab. 40 (figs. 1-6), tab. 41 (fig. 1). neotypes Krombholz. 1836. Natur. Abbild. Beschreib. essbar. schädl. verdächt. Schwämme Heft 4: taf. 29 (figs. 14-17).